What are the Roth IRA redemption rules? You need to know the answers. Remember, the whole purpose of your Roth IRA is to generate tax-free income in your retirement years. So you want to begin your retirement savings plan with the end game in mind. Take the time to learn the Roth IRA rules, particularly when it comes to redeeming your Roth IRA funds without being subject to taxes or penalties. Let's take a closer look at each redemption scenario. According to the Roth IRA redemption rules, Roth IRA principal withdrawals are tax-free and penalty-free regardless of your age or income bracket. Regardless of the circumstances, you can always redeem your original Roth IRA contributions without having to worry about taxes or penalties. For instance, let's say you're 22 years old, and you make a $5,000 contribution to your Roth IRA. Since you just graduated from college, you haven't had a chance to save up for an emergency fund yet, but you know saving early for retirement is important. After a few months, you learn that the company you work for is laying people off - and you're one of them! With little money in your savings, you withdraw $5,000 from your Roth IRA to pay your living expenses while you search for a new job. Because you originally contributed $5,000, the entire amount is tax-free and penalty-free. But what about the Roth IRA redemption rules for investment gains? Can you withdraw capital gains, interest, or dividends tax-free and penalty-free? If you meet both of these conditions, then your Roth IRA redemptions are entirely tax-free and penalty-free. But if fail to meet either one, only redemption of your original contributions is a tax and penalty-free event. $50,000 in original contributions and $207,000 in investment gains. If you want, can you withdraw the full $257,000 tax-free and penalty-free? Because you're 57 years old, and although you've met the requirements of the Roth IRA 5 year rule, you haven't reached the required age of 59 ½. But let's say we fast forward three years... You're now 61 years old with $315,000 in your Roth IRA. 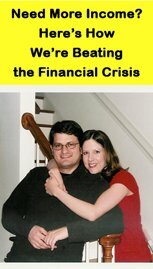 If you want, can you withdraw the full $315,000 tax-free and penalty-free now? Because at age 61, you're now in compliance with both the 5 year rule and requirement to be age 59 ½ or older. Now, let's go a step further and assume that at age 59 you made a $50,000 Roth IRA conversion. Can you still withdraw the full amount in your account at age 61 tax-free and penalty-free? But why? After all, you're over age 59 ½ and you've met the 5 year rule requirement, so all your redemptions should be tax and penalty-free. Right? In theory, but you need to know about one more Roth IRA redemption rule - one regarding conversions. According to the Roth IRA redemption rules, each Roth IRA conversion you perform is independently subject to the Roth IRA 5 year rule requirement. In other words, regardless of the age of your account, you must wait at least 5 tax years after your Roth IRA conversion before you can make a tax-free, penalty-free redemption of those conversion funds. Using the above example again, let's assume you perform a $50,000 Roth IRA conversion at age 59. It's the year 2012, your account is now worth $307,000 - $50,000 in original contributions, $50,000 in conversion funds, and $207,000 in investment gains. When can you redeem your entire account tax-free and penalty-free? Because 2017 is the year when your Roth IRA conversion meets the requirements of the 5 year rule. The clock started ticking in 2012 when you first performed the conversion - 2012, 2013, 2014, 2015, and 2016. So in 2017, you can withdraw your $50,000 in conversion funds tax-free and penalty-free. But in the meantime, your hands aren't completely tied. Remember, under the Roth IRA redemption rules, you can always redeem your original contributions tax-free and penalty-free at any time and for any reason. So under this scenario, you can withdraw up to $50,000 in original contributions tax-free and penalty-free while you patiently await the year 2017 when you can withdraw all your funds tax-free and penalty-free. The Roth IRA rules for redemption are fairly straightforward. Non-principal contribution redemptions which are not in compliance with the age 59 ½ or 5 year rule requirements are subject to income taxes at your normal tax rate and a 10% early withdrawal penalty. 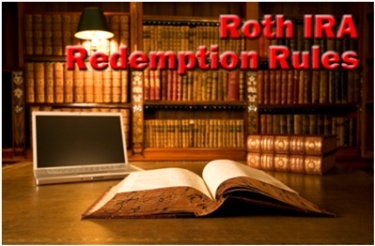 So make sure you know and understand the Roth IRA redemption rules!